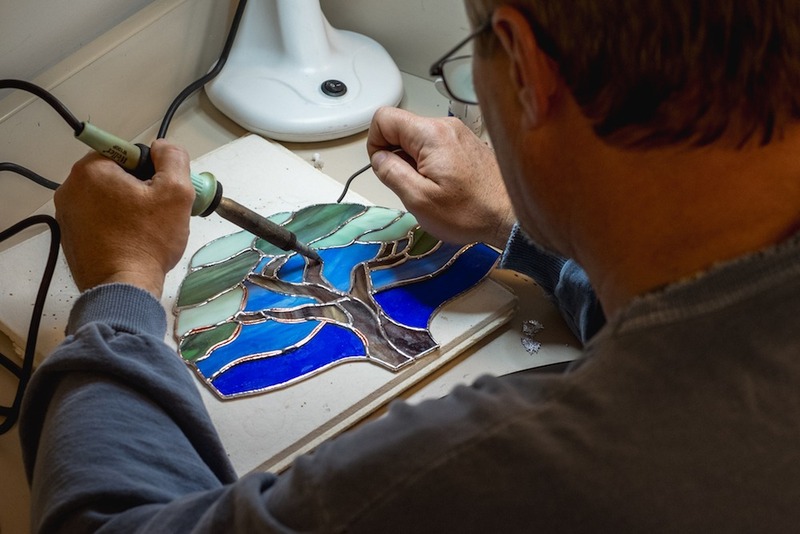 This program focuses on stained glass creation using the copper foil method which is done in five principal steps: designing on paper and transferring the design to glass, cutting glass and grinding down the edges, wrapping glass pieces with copper foil, soldering the pieces, and applying finishing patinas. Registration fees include use of grinding and soldering tools. Beginners’ kits are available for purchase at $20, which is payable directly to the instructor and includes supplies (glass, solder and foil) for three suncatchers. Students will have to purchase theirs own supplies if they complete the beginner kit and choose to start a bigger project. Millie Harpell began working with stained glass in the early 1990’s. She practiced under the direction of Robina Bagnell and Irene Campbell. Millie work includes sun catchers, window valences, panels – small and large, lamps – simple to complicated and light boxes. Millie finds Stained glass very exciting and a rewarding hobby. Jane MacNeil began taking stained glass classes in the early 1990’s when the School of Crafts was located at the Lyceum on George Street. She was very lucky to be mentored by three fantastic Instructors, Doug McGillivray, Robina Bagnell and Irene Campbell. Throughout the years Jane created many stained glass items such as sun catchers, large size panels and lamps. Her favorite pieces have always been Angels. To this day it amazes her what beautiful items can be created with glass if you have patience (sometimes a lot of patience). Stained glass is a great hobby with extremely rewarding results after your work is completed.